Hello my lovely readers!! Hope you all had a pleasant weekend with your family and loved ones! This is actually a different kinda post that I wanted to get some feedback on. I know a lot of you find all sorts of blogs through link parties, I've joined a few myself. Whether it be simple blog hops, recipe hops or DIY hops. And me being a big thrift store addict, have not come across many thrift store link parties. So I thought it would be fun to start my own "link party/blog hop" with a specific blog post dedicated to thrift store finds. It would be cool to meet other bloggers with the same interest and check out their awesome thrift store scores! I ALWAYS have plenty to share! So my question is would any of you be willing to co-host one of these puppies? You can comment or email me in interested!! 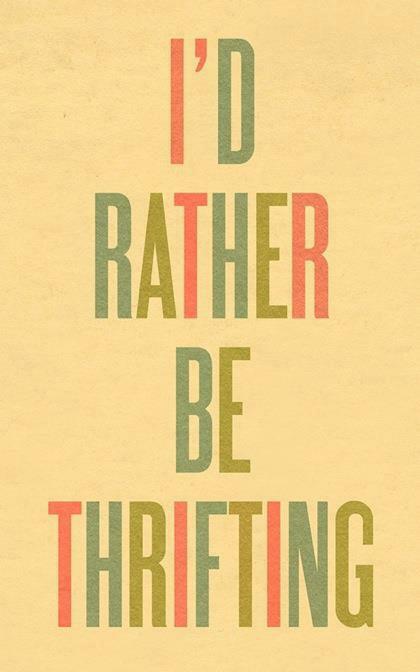 Wow, this is so me.. "I'd rather be Thrifting" I love to be friends with thrifty persons.. Hope we can follow each other. I think this is a great idea! I'd love to co-host someday if you need someone! I love thrift stores! You'll find so many neat things! Thanks Leslie! The link party is going live next Thursday! Hope you can stop by! Thanks Heather! I hope you can link up! I would love to help out! I love Thrifting, which is why my blog is all about it. :) Let me know! New follower - thank you for stopping by my blog today! I am looking forward to following along with your adventures. very cool! I don't have enough followers to cohost, but maybe in the future! I am your newest follower (returning your follow), and while I welcome reading about thrifty finds I am not sure I can commit to hosting it. In the meantime, it's a great idea and I look forward to more visits. Sounds fun!! Would love to do a co-host, just let me know!! Happy Monday! I'd be happy to participate. I'm not sure what entails co-hosting but it looks like lots of people are interested in doing it with you! Can't wait! Thanks Olivia! Hopefully you can link up!! If you'd like to co-host sometime let me know. Thanks!! Hope you can link up!! Yes I'd love this. I love checking out everybody's thrifted treasures! Great! See you next Thursday!! this is such a great idea! found you through the wednesday link up! Thanks hun! Hope you can link up! !